In July 2008 we moved into our new house in Ellis Hollow. The grounds had not been cared for in months and a healthy crowd of both native and invasive wildflowers had made itself at home in the yard and flowerbeds lining the sides of the little white house. Over the remaining summer and fall months I surveyed our yard and the edge of the adjoining scrap of old-field, learning some of the interesting species beside which I had moved in. One species in particular caught my attention from the start; a beautiful broadleaved herb with quarter-sized bright bluish-purple flowers and conspicuous ¼ inch long spines running along the stems. On a visit in August my grandmother-in-law noticed the plant right away growing in my garden, pointing and exclaiming “Che zi!” in her native Chinese. Indeed the plant is readily recognizable as a close relative of the “eggplant” to which she referred. It is one of the beautiful members of the nightshade family (Solanaceae) native to our area, the common horse nettle, Solanum carolinense. While quite beautiful in spring this plant is also noticeable in January producing clusters of golden fruit that can persist on the stem into the winter months. Look for them dangling a foot or two off the ground along the roadsides and in the old-fields of our area. Beware, however, the plant and its fruit are very poisonous if eaten! 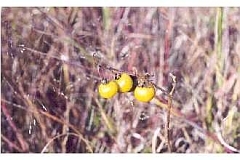 The immature fruit is a beautiful green-striped berry resembling a tiny tomato. The reputedly less-toxic mature fruit and leaves were once used in Native American medicine to treat illnesses including epilepsy and dog’s mange, and to expel intestinal worms. Emerging in spring, S. carolinense grows up to 3 ft tall and has pubescent leaves around 5 inches long. The leaves are quite variable in shape, broadly to narrowly elliptical, ranging from irregularly lobed to coarsely toothed. They are unusual in that they often have long, sharp prickles that run along the midrib in addition to the prickles that line the stems (watch out!). The flowers are conspicuous throughout summer and fall, occurring in showy, axilary racemes. They are star-shaped and range from pure white to vibrant blue-lilac in color. Bright yellow stamens form a cone at the center of each flower and approaching bees use the rapid movement of their wings to loosen pollen from the specialized anthers. 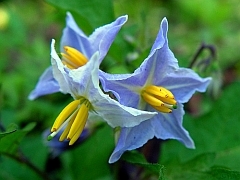 This unusual pollination mechanism is called a buzz-pollination (see wikipedia) and is common in the nightshade family. Horse nettle is a perennial plant with deep roots, preferring sandy or disturbed soils. It reappears year after year in our local pastures and along roadsides, spreading quickly via underground rhizomes as well as seeds. In several southern states, this plant is considered a noxious agricultural weed as it is a vigorous grower and can be resistant to herbicides – the poisonous fruit and sharp prickles do not add to its general likeability among home gardeners! I prefer to consider this species, with its unusual botanical features, merely a plant with character, beautiful to admire in almost any season. USDA, NRCS. 2008. , The PLANTS Database, 23 December 2008. National Plant Data Center, Baton Rouge, LA 70874-4490 USA. Tenaglia , D. Photographs and descriptions of the flowering and non-flowering plants of Missouri, USA. website accessed 12-2008. 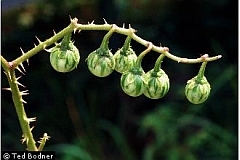 Green fruit: Ed Bodner @ USDA-NRCS PLANTS Database / Miller, J.H. and K.V. Miller. 2005. Forest plants of the southeast and their wildlife uses. University of Georgia Press, Athens.